Take an adventure across the spine of the Andes, through the heart of Argentina. The northwest region houses some of Argentina's most inspiring scenery from colourful mountains and barren salt plains, to spectacular gorges and lunar landscapes. Woven into this tapestry is a strong cultural and gastronomic presence; discover the indigenous heritage still found in the Andean region, manifested in the art, weavings and lifestyle of the locals, and taste authentic Argentinian Malbec in one of the many vineyards. The city of Buenos Aires is a wonderful end to the trip. The most cosmopolitan of South American cities, Buenos Aires is an eclectic jumble of neighbourhoods, where Spanish, French and Italian classicism rubs shoulders with remnants of Victorian grandeur. In the larger boroughs of Recoleta or Palermo, wide avenues and elegant squares highlight the capital's historical affluence, while the narrow cobbled streets of San Telmo and tumbledown houses in La Boca showcase the diverse cultural mix found in the city. We check into our hotel today in anticipation of the journey ahead. 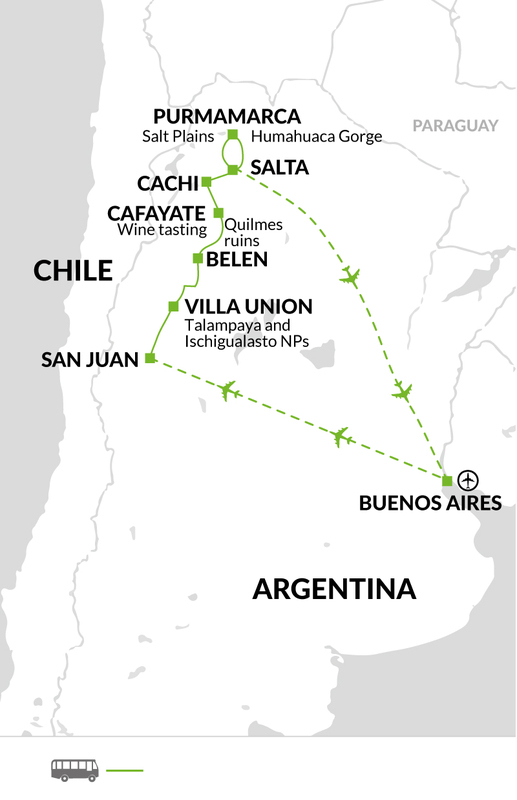 This morning we set off early on our two hour flight to San Juan, one of Argentina's gateway hubs to the Andes. (Please note that for the May departure, we will be flying to Mendoza due to the fact that San Juan Airport is undergoing maintenance throughout the month of May). On arrival to the airport, we drive to Leoncito National Park. The park is a protected area with very strict regulations on air pollution, and due to the quality of the atmosphere it is also an important centre of astronomy. We will visit the Leoncito Observatory which is one of the best spots in the southern hemisphere for astronomic observation. Given San Juan's extremely high percentage of sunny days and its dry weather, the location guarantees open clear skies all year round. We will have an introductory talk with a local astronomer who will explain how to interpret the sky and give us an insight on the research taking place at this remote station. This talk will last approximately one hour, after which we can explore the visitor centre at leisure. Following this we continue onto the small town of Barreal. We have a long day of driving today, approximately seven hours, to Villa Union. Much of the drive is on the iconic Route 40 - much like Route 66 in the US, the road is embedded into the country's culture, taking travellers from Salta in the north down to the wilds of Patagonia. Most of the road is paved, with just 120km of dirt roads, passing through small villages, ancient pre-hispanic settlements and the 'Las Burras' Gorge road, winding through the mountains. Villa Union is the jumping off point for exploring the Talampaya and Ischigualasto National Parks, which we'll be visiting over the next two days, and is a sleepy town with the shadows of the Andes in the background. On the 13th May departure there are some works happening on the roads through the Las Burras Gorge, and as such we will be taking a different road, making stops at the immense Cuesta del Viento dam and the small town of Rodeo, as well as other natural highlights on this spectacularly scenic drive. A day full of weird and wonderful lunar landscapes awaits us today as we drive to Ischigualasto National Park. Popularly known as 'Moon Valley', this park, together with its neighbour Talampaya, was granted UNESCO heritage some years ago. The hike to Cerro Morado Hill will take us to many balcony-style look out points with excellent vistas across the whole valley. The round trip hike takes approximately three hours, and there is a moderate 400m climb up to the top of the hill, with chances of spotting centuries old plant life, unique to the valley. We will also explore the unique rock features found in the park, by bus, before returning to Villa Union. Talampaya National Park is the site of our exploration today - once the kingdom of dinosaurs, this park, along with Ischigualasto, contains the most complete fossil record known from the Triassic Period. The scrub desert boasts fossilised remains of a wide range of ancestral animals and plants. Even for those amongst us who are not scientifically-minded, the park is an impressive show of geological wonders. The main attraction is the canyon, an imposing red rock trench carving through the desert floor. From here we can observe the oddly shaped rock towers with evocative names such as the Chimney, the Monk, the Elevator and the Cathedral - more akin to a Martian journey than our expectations of Andean scenery. After our visit, we head to Belen in the heart of the Catamarca province. Setting off this morning to Argentina's northern winelands around Cafayate, we stop at the indigenous Quilmes ruins en route. The Quilmes people, dating back to around AD1000, famously resisted the Incan invasion and lived through over a century of Spanish colonisation. The large site is made up of the remains of terraces rising up the cacti-covered hillside - we can walk to the top for excellent views of the valley and the site. Although not as impressive as other archaeological sites in the Andes, it helps us to understand the indigenous heritage in this part of Argentina. Finally, we arrive in Cafayate in the early afternoon for a round of wine tasting in two of the region's rustic wineries, their rows of green vines backed by the spectacular mountains beyond. We might try Argentina's main white wine, Torrontes, famous in this region. The Argentina of the Andes is steeped in Inca heritage, and the indigenous populations have retained many of their old traditions - in small towns like Cafayate, local methods of weaving have been maintained since pre-Hispanic times, and during our journey through the Andes we may admire their woven clothes, hats, sweaters and ponchos in llama and vicuna wool. Today this journey takes us to Cachi through 'Broken Arrow Gorge', a spectacular formation of sharp, pointed rocks shooting up through the air at all sorts of different angles; the road that we travel on pierces this dramatic and surreal landscape. We'll take the opportunity to stop en route at viewpoints, with some short walks and small village visits. On arrival in Cachi (2530m altitude) we have some free time. We can use the time to relax and wander the cobblestoned streets and tranquil plazas of the town. This morning we have free time in Cachi to explore some of the surrounding mountain trails. In the afternoon, we head on to Salta, down the 'Bishop's Hill Road', 20kms of hairpin bends that offer views down to the Sierra del Obispo. During the three hour drive the change in scenery is simply amazing, as we travel from the cactus filled deserts of the Cardones National Park, down to lush green mountains, blanketed in vegetation and eroded by rippling brooks and streams. We stop to discover the spectacular mountain views at the various viewpoints on route to Salta - one of the more lively cities in the north of Argentina, it is a blend of colonial architecture, fascinating museums and buzzing nightlife. Tonight we can get a taste of its music scene at a 'pena', a traditional folk music hall where locals come with guitars and take turns in playing and singing. Dinner is included. Salta's grand neo-Classical buildings and bustling town squares are perfect for exploring on foot. In the heart of the city we discover the extraordinary pink cathedral and the San Francisco Church. We get a great view of the city and surrounding valleys from San Bernardo Hill - we're taking the cable car, but for those who fancy the exercise there's a walking route up 1000 steps, with the 14 stations of the cross built into the side of the hill. On descending, we have the option to sample a classic northern Argentinian food; empanadas in Argentina are much like the pasties of Cornwall, but much smaller, lighter, and in a wider variety of flavours - all deliciously addictive! Our Explore Leader will take those interested to the Patio de la Empanada, a giant courtyard packed with tables surrounded by different empanada kiosks. Eating is optional but highly recommended; the best option is to get a variety and share. After a filling lunch, we have free time in Salta to explore the local handicrafts or head to the coffee shops to taste another Argentinian staple - Alfajores. These are cakey biscuits filled with 'dulce de leche', perfect with an afternoon tea. Alternatively, our Explore Leader can take us on a hike through San Lorenzo Gorge, a nature reserve found at the foot of the Andean mountains just 10 kms from the city centre. Within the gorge we hike through Yungas forest, a fertile green landscape of ferns, creeks, moss and colourful fauna. We hope to see wildlife here, perhaps foxes, small deer, hawks or toucans. During this four hour hike, the mid-afternoon light through the trees is beautiful, and we will be rewarded for our uphill efforts by the views over the deep, green valley below. A day of spectacular scenery awaits us as we head towards the mountain town of San Antonio de los Cobres, following the rails of the famous Train to the Clouds by vehicle as we ascend through the winding Toro Gorge to reach the rugged and sleepy backwater town. The change in scenery is dramatic, as the multi-coloured cacti-strewn mountains are followed by silent high-altitude desert. San Antonio lies at 3775m, a small town surrounded by bleak landscapes. After taking in the views we descend, traversing the lunar landscapes of the Puna Jujena and the Salinas Grandes flatlands, where entire families of salt workers make a hard living of working the soil of the salt flats. Our road literally pierces through the salt flats, and the blinding white cracked surface of the floor seems endless, making the mountain backdrop seem almost dwarfed in comparison. We spent a little time exploring the flats, before entering the Humahuaca gorge area, and arriving at the village of Purmamarca. Today we set out to explore the UNESCO Heritage area of the Humahuaca Gorge, a highlight of any trip to the northwest of Argentina. Purmamarca is one of the towns within the gorge, and setting off today we can appreciate the town's incredible backdrop - a mountainside named the 'Seven-Coloured Hill' for its bright shades of yellows, oranges, reds and greens. Indeed, the rest of the day's journey is awash with colour and scenic roadside lookouts; another appropriately named mountain is The 'Painters Palette'. Through our exploration today we visit the regions old traditional villages, such as Tilcara, Maimara and Humahuaca - these villages are perfect people-watching opportunities, and it's interesting to see once again the heritage from the pre-Columbian period which gives this area of northwest Argentina a very distinct sense of cultural identity. This is not only manifested in the woven items that we have seen in other towns, but also in the local diet, with northern food including llama stews and corn dishes. We return to Salta this evening and can make the most of our journey in the north by eating at one of the local restaurants. We say goodbye to the northwest and catch our flight back to Buenos Aires. This afternoon we take a tour of the southern part of the city, exploring the major landmarks around the Plaza de Mayo, site of the famous mass demonstrations by supporters of Juan Domingo Peron in 1945, organised by his wife Eva. We also visit the arty district of San Telmo, with its small one-way streets and walls covered with street art and graffiti. The tour ends in the colourful vibrancy of La Caminito in the La Boca district of the city. Settled originally by Italian migrants, the area is famed for its bright houses and lively street performers. We will surely come across the tango being performed on some street corners, a dramatic difference to the Folkloric dancing in the northwest, and highlighting the capital's affiliation with Europe in this most Latin of dances. This evening we have an opportunity to enjoy something of Buenos Aires' dazzling nightlife and soak up the pulsating rhythms of one of South America's most captivating cities. Our trip ends this morning in Buenos Aires after breakfast. There is plenty to love about Buenos Aires, so if this is your first visit we recommend adding a couple of extra nights here to enjoy the city and its surroundings. The best time to visit is spring (Sept-Nov) and autumn (March- April). Between June and September the heat in the northern part of the country is less intense. Remember rain can fall at any time of the year and the weather is changeable in the mountains. Easter Island has a tropical climate so is likely to be quite hot and humid. It can also rain there in the evenings and become chilly. A warm sweater or fleece, good waterproofs and a windproof jacket are all essential. Laundry services are available throughout. Comfortable and sturdy walking boots with good ankle support and tread are useful for the walks. Trainersandals for relaxing in. One main piece of baggage and daypack. Total allowance for your international flight: 44lb/20kg. Luggage limit for domestic flights is 15kg. Water bottle, insect repellent, suncream (at least factor 15), good quality sunglasses and a lipsalve with sun protection and walking poles (if you use them). Carry all your funds in US cash NOT Sterling. We recommend to take a minimum of US$400-$500 of your total spending money in cash for your tour, in mixed denominations. Notes should be in good condition otherwise they might be difficult to exchange. Credit cards are useful and can be used in many places, but may be subject to a service charge. Please note we require a photocopy of your passport 3 month pre departure. It is essential that you provide Explore with a photo copy of your passport at the time of booking, as this will be required in order to confirm accommodation. Argentina: Visas are not required for UK, US, Canadian, Australian and New Zealand citizens. Please note Australian passport holders will need make a payment called the 'reciprocity fee' in advance of travel to enter Argentina. This currently costs US$ 100. This payment needs to be made online at http://www.migraciones.gov.ar/accesible/templates/reciprocidad/reciprocidad.htm The receipt generated at the time of online payment must be printed and given to local immigration authorities together with your passport. You should confirm all visa related issues with the relevant Embassy prior to departure. Nothing compulsory, we recommend protection against typhoid, tetanus, diphtheria, polio and hepatitis A. Please consult your travel clinic for the latest advice on Malaria, Dengue Fever and Zika Virus. Please take preventative measures to avoid mosquito bites - these include mosquito repellent as well as long trousers and long sleeve shirts to cover up when necessary. Please note many countries in Central America, South America and the Caribbean require a yellow fever vaccination certificates if travelling from infected areas. A detailed list of these countries can be found on the NaTHNaC website - http://travelhealthpro.org.uk/countries. Also on the NaTHNaC site there is a list of Countries (and specific areas within a country) which are at risk of infection and a vaccination is therefore recommended. Please check the latest requirements with your travel clinic or doctor prior to departure. The above is not an exhaustive list. Further information regarding vaccinations and travel health advice can be found by following the NHS and NaTHNaC links at Explore Travel Health and from your local healthcare provider. Visa and vaccination requirements are subject to change and should be confirmed by you before travelling. The northwest of Argentina is still relatively unvisited compared to Patagonia, which is a shocking fact given how much there is to enjoy here, and the diversity of the landscapes. The food and drink scene is incredible, and we include wine tasting in the vineyards on this trip as well as plenty of opportunities to taste the typical food like empanadas, local cheese, llama stews and, of course, Argentinian steak.